As we move forward at an ever increasing pace besides fully activating the Helm menu the target indicators are now active. Several tries resulted in this health indicator, it is like many other games where the health is located in the upper left corner, it is very bright and easy to see. 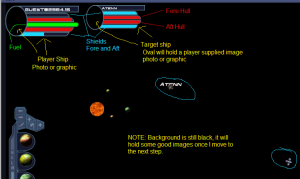 One issue I had even in silverlight was how to display the energy, as you can see in the below graphic i placed it between the fore and aft indicators for the player. This modification gives the player a one stop glance to see how they are doing, shields, health and energy. As you can see in this graphic, the players fore shields are down and a slight hit to the fore hull has been taken.